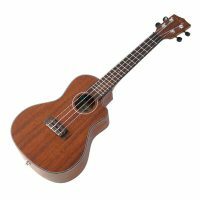 Baton Rouge 8 String Tenor Ukulele-The Baton Rouge 8 String Ukulele is a must for any uke players collection,with its full sound it is ideal for solo or group playing. The Baton Rouge 8 string ukulele offers fantastic value for money and is a great option for any uke players who fancy adding something different to their collection. The sun design is nicely finished and the Chrome, classical guitar style machine heads finish the instrument off very well. The instrument is constructed from laminated wood and finished with mahogany. It has a slightly curved back which contributes to its loud and open sound. The fact that it is unvarnished also has an effect on the sound, giving it a softer tone than other ukuleles with a high gloss finish. Introduction: The tenor uke is bigger than both soprano and concert and usually tuned to C tuning. Soprano and concert ukes are tuned GCEA (C tuning), or ADF#B (D tuning).